The Acheulean was the longest lasting cultural phase in human history, existing for 1.5 million years. It is chiefly defined by the handaxe, a stone tool used by early humans during an epoch of profound evolutionary changes. However, while much attention has been given to the important question of how and when the Acheulean began, we know very little about how it ended. In Africa, where the Acheulean began, investigations have revealed dates as young as 200 thousand years ago (kya). Beyond Africa, young dates of around 130 kya have been reported in India. This means that in some areas the Acheulean survived long after newer core and flake technologies were being made by our species, the Neanderthals and possibly other hominins such as the Denisovans,. This stands in considerable contrast to the idea we have often had of a neat linear progression of cultural change in deep prehistory. It also begs questions as to how and why these populations remained so different. Were they somehow isolated? Were they driven into more marginal regions by larger brained hominins such as ourselves or the Neanderthals? Excavated handaxes and large flakes at Saffaqah. Photo Credit: Palaodeserts. 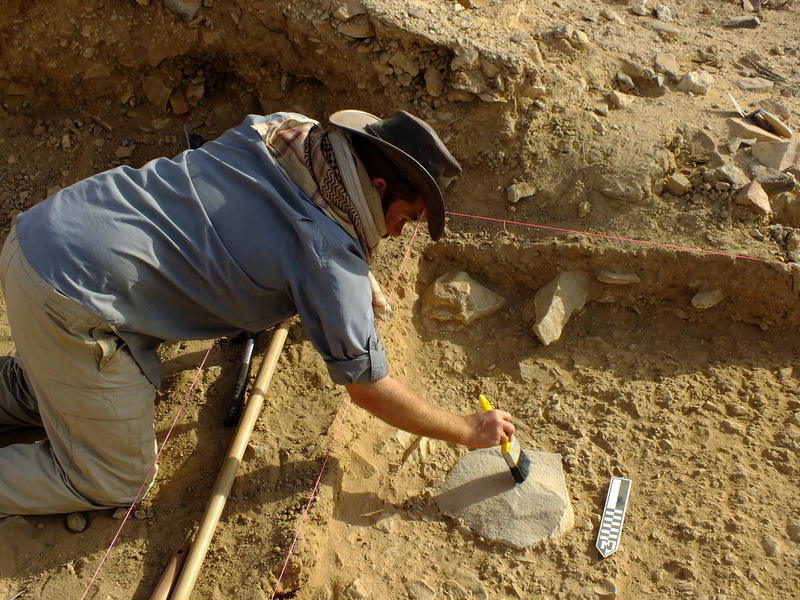 To help address such questions, Professor Michael Petraglia set up the Palaeodeserts Project in 2013, following several years of pilot fieldwork in the Arabian Peninsula, the nexus of the Old World. At the beginning of this work, almost nothing was known about the Arabian Peninsula’s role in human evolution and deep prehistory. It was generally assumed that hominins had never lived in such harsh environments. Yet archaeological surveys conducted in Arabia in the 1970s and 1980s reported numerous Acheulean tools. In most cases, these were lying on the surface. However, in one case, an amateur archaeologist named Norman Whalen reported a buried locality he and a team of Saudi researchers had excavated, featuring thousands of handaxes and other stone tools. We returned to Whalen’s trench near the village of Saffaqah in the Dawadmi region of central Saudi Arabia. After conducting a landscape survey, we cleaned up the old trench and extended it. Through these new excavations, we recovered over 500 new artefacts and made a detailed stratigraphic assessment in the process. We also obtained samples for chronometric dating using modern methods. 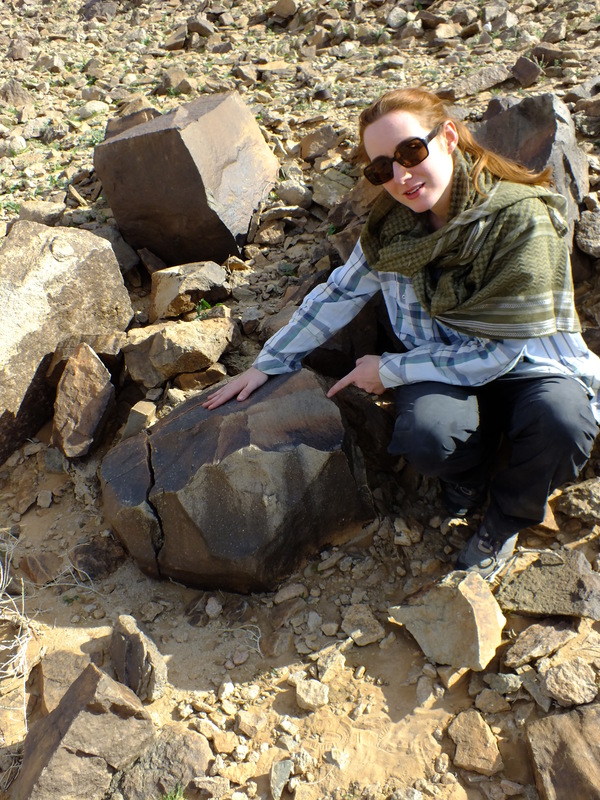 A huge core from which large flakes were struck to transform into handaxes. Photo credit: Palaeodeserts. Critically, our excavations revealed an incredibly intact Acheulean occupation layer, which we bracketed with two sediment samples for dating. We dated the sediments using two different methods of a technique called optically stimulated luminescence, which measures the length of time since sediment was exposed to sunlight. The results showed that this occupation layer was younger than approximately 250 kya and older than 190 kya. However, there is a catch in all this: there were further Acheulean occupation layers overlying the one we dated. These layers must be younger than 190 kya. What are the implications of this work? First of all, the dates show that the site of Saffaqah is the youngest Acheulean site in Southwest Asia. Secondly, although global climate patterns suggest the area of the site was probably wetter than it is today when the Acheulean occupation became established, it was probably still an arid region, and therefore marginal to human habitation. It also seems likely that there was an environmental downturn from around 191 kya, when a transition to a generally more cold and arid climate phase began. The establishment and continuity of the Acheulean at Saffaqah suggests that these populations were either forced into marginal areas by groups of large brained hominins or that they themselves had become smart enough to be able to survive in more challenging environments. Finally, it is possible that these Acheulean populations were sharing southwest Asia with the Neanderthals, and possibly even Homo sapiens. Both of these species had long made assemblages focussed on ‘core and flake’ technology, so it possible that the production of such ancient looking artefacts at Saffaqah means that they were made by a different species. Human fossils are rare, while stone tools are abundant. Yet figuring out which hominin species made which stone tool assemblage is very challenging. Whoever was responsible, our findings shown that the Acheulean did not end abruptly, but rather faded out after a drawn out fight.